Wind power capacity is an indicator of building a sustainable economy because wind is poised to become the foundation of the new energy economy. With total capacity exceeding 318,000 megawatts, wind farms generate carbon-free electricity in more than 85 countries. Twenty-four countries have at least 1,000 megawatts. The wind power capacity installed worldwide would be enough to meet the residential electricity needs of the European Union’s 506 million people. Wind is abundant, carbon-free and nondepletable. It uses no water, no fuel, and little land. Although a wind farm can cover many square miles, turbines occupy only 1 percent of that area, leaving space for growing crops or grazing livestock. Unlike coal, gas, and nuclear power plants, wind farms do not require water for cooling. In China, wind-generated electricity surpassed generation from nuclear power plants for the first time in 2012. Wind’s advantage over nuclear increased dramatically in 2013. In the United States, wind accounted for at least 12 percent of the electricity generated in nine states in 2013, including Iowa (27 percent) and South Dakota (26 percent). Texas, long the leading oil-producing state, is now the U.S. wind power leader. 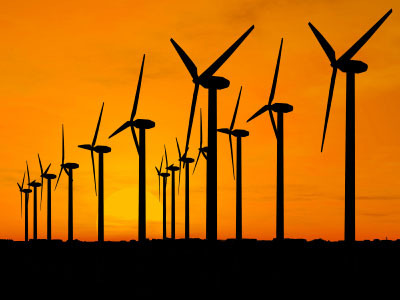 The European Union added more wind capacity in 2013 than it did natural gas, coal, or nuclear. Denmark produced one third of its electricity from the wind in 2013, a higher share than any other country. In northern Germany, four states get at least half of their electricity from wind farms. The United Kingdom hosts more than half of the world’s offshore wind generating capacity. Denmark, Belgium, Germany, and China round out the top five offshore wind countries. Each of the world’s leading carbon emitters has enough wind potential to meet electricity needs. Wind power is often highly competitive with coal, natural gas, and nuclear power in areas with strong wind resources. And costs continue to fall: In the United States, the average price of wind-generated electricity has dropped 40 percent since 2009.